Occasionally, automatically created depth maps lack sufficient contrast: they look flat because of insufficient differences between depth intensities. The YUVsoft Depth Normalization plugin automatically adjusts the depth level, increasing contrast in the depth map. The same tool also handles temporal instability in depth maps, reducing the level differences between adjacent frames. Both effects are achieved by automatically equalizing depth map histograms. 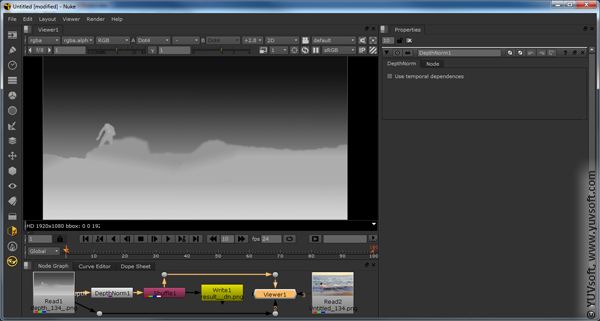 Input for the Depth Normalization plugin is a single depth map or depth video. The output is a depth map with increased contrast—and reduced temporal instability, in the case of a depth map sequence. You can also adjust a single frame using YUVsoft Depth Normalization and then apply these changes to the entire scene using the YUVsoft Depth Propagation plugin. Depth Normalization plugin for Adobe After Effects. Depth Propagation technology – propagates the frame’s depth information through the whole video sequence. Depth Propagation from a depth key frame created by Depth Effects. Depth Effects technology allows to obtain detailed depth for static scenes and background areas. Depth Effects plugin for The Foundry Nuke. Depth Refinement technology – corrects edge mismatches between the source frames and depth map. Depth from Motion plugin for The Foundry Nuke – a good solution for obtaining key frames from scenes with camera motion.